Gigaba ? towards the end game? Embattled Home Affairs Minister Malusi Gigaba has gone from positioning himself as a victim of circumstance, to issuing threats and even defiantly refusing to step down from his position, amidst growing calls for President Cyril Ramaphosa to fire him. The minister has been at the centre of numerous controversies, starting with a leaked private video of him engaging in a sexual act, to the Constitutional Court dismissing his application for leave to appeal a decision from the lower courts that he lied under oath about approving the Oppenheimers' private terminal at OR Tambo International Airport. Public Protector Busisiwe Mkhwebane reached similar conclusions about Gigaba in her investigation into the Fireblade deal. Businessmen involved the saga - Nicky Oppenheimer and Manne Dipicio - told Parliament that the minister had also lied when he appeared before the Portfolio Committee on Home Affairs. "He is almost daring the president [to fire him]. It creates an opportunity for him to act as a victim and collateral damage in a bigger fight, that allows for the premise to create a campaign towards 2022," said University of KwaZulu-Natal political analyst Lukhona Mnguni. Mnguni's observation provides some insight as many question Gigaba's strategy and wonder if, how and when Ramaphosa will move to deal with such a controversial figure threatening his "new dawn". The minister faces more trouble, with news of a leaked preliminary report into Eskom suggesting he and former public enterprises minister Lynne Brown are among 44 people and 25 companies who should be criminally investigated over alleged mismanagement and corruption at the utility. To understand Gigaba's "fight-back" strategy, it's important to track his history in the ANC. According to Mnguni, the minister has always been seen as a leader in a generation of heirs to the ANC throne. This perception was further strengthened by his trajectory within the movement and in government, where Gigaba served in numerous portfolios, including the critical post of finance minister. "Truth is, in ANC circles, he is probably the one person of his generation who had a clear path of where he is going, and the abrupt manner in which that path is being disrupted is what has him up in arms," said Mnguni. "This is almost blindsiding him; he never imagined this would happen. He thought he worked hard enough to endear himself to the current president by making calls for Zuma to do the right thing." But Gigaba needs to understand the ramifications of going on CNN in February and calling for Zuma to "do the right thing" and resign. "The first question to have been asked of him is what did Zuma do to be asked to do the right thing? What was he found guilty of?" Mnguni said. At the time, when calls were being made for Zuma to step down, there was a series of allegations against him, but no guilty verdicts or convictions. Yet, that was seen as sufficient reason for the former leader to be asked to do the honourable thing and resign. "Malusi tried to endear himself to Ramaphosa, using Zuma's hand, almost accepting that a public office bearer must be held to a higher standard," said Mnguni. News24 columnist and political analyst with Unisa's Department of Political Sciences, Mpumelelo Mkhabela, describes Gigaba's actions as desperate and warns that if the minister continues making disparaging comments about the judiciary, he might find himself hauled before the courts yet again. "In defence of the integrity of the judiciary, someone could take him to court," warned Mkhabela. Gigaba's strategy might come back to bite him, as he himself linked all his scandals together, suggesting there is one big plot to discredit him. He also completely removed the president, at whose pleasure he serves, from the equation. 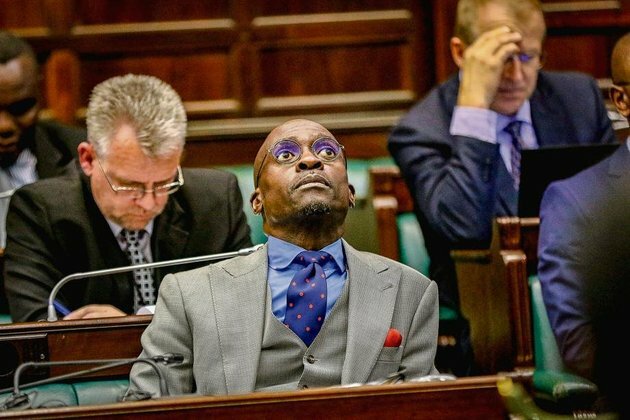 "Gigaba tweeted that he's getting guidance from his lawyers and the ANC. Where's the president sitting in this picture that he is painting? He omits Cyril Ramaphosa who appointed him," noted Mkhabela. "These people are caught in compromising situations, then say they can't resign, almost as if the job of serving the public is an entitlement." But Mnguni said that the political game Gigaba is playing does not permit a resignation. "Resigning kills the story and means he almost accepts that he is at fault and needed to remove himself. How do you justify coming back from that?" Both Mkhabela and Mnguni said that Ramaphosa is in a tight corner and needs to be seen to be taking some sort of action against Gigaba. The president has numerous options to do so, which might include firing him or just reprimanding him, and then producing evidence of this to Parliament and the Public Protector. But the president cannot take action against Gigaba and leave out Minister of Women Bathabile Dlamini, after the Constitutional Court handed down an order against her. In September, the highest court in the land ruled that she was personally liable for 20% of the legal costs for the social grants debacle. It also said the National Prosecuting Authority had to determine whether Dlamini should face a perjury charge for lying under oath about her role in the South African Social Security Agency (Sassa). "There are really no grounds to keep these people. The violation of the Constitution is the highest crime. There is merit for them to be fired, strong merit," said Mkhabela. "What must be delaying Cyril Ramaphosa, is he needs to apply his mind about a replacement and political consequences... beyond legal findings, the president must think politically. "He also has to think about the optics within his own party and the politics of KwaZulu-Natal. "Gigaba is trying to make the ANC a political refuge. The question is, does the ANC have to consider whether those who have embarrassed it as an organisation and government, should be allowed to use it as a political refuge." A potential rebellion from the ANC's largest province, KwaZulu-Natal, will also be on Ramaphosa's mind. "A rebellion, even if it's cooked up underground, will brew hostility and then the 2020 national general council (NGC) threat becomes real," said Mnguni on murmurs that some in the ANC are plotting to remove Ramaphosa when the ANC convenes its NGC in two years' time. While Ramaphosa has limited space to act, Gigaba will use the gap to position himself. "He knows the president has to act. I won't be surprised when, if he is removed, we start seeing him a lot, especially at Youth League events," said Mnguni.